straw color, very vanilla nose, lemony, cereals. Better on the palate, quite lively and powerful, with a slightly sweet side, vanilla, no caramel here, and more and more salt. Final of good length, very iodized, acidulated. Not much less freshness than in the Flotilla, less roundness, but more iodine and a little more powerful. More fruity, more malty and more vanilla than the 2nd release, plus a bit more punch due to its higher ABV. Vanilla sugar, coconut, honey, marzipan, malt, citrus, kiwi, salt, earth and floral notes. Marzipan, vanilla, lime, liquorice, malt, apricots, hazelnut, coconut, white chocolate, berries, citrus and iodine. Almonds, nut oil, vanilla, lime and green apple. Nose: vanilla and demerara sugar. Taste: slightly tart and fruity - apricots and peaches. Finish: trademark salt on the finish. Possibly my favourite OP from the ones I`ve tried. The nose is nice, vanilla, vibrant fruit. Taste, more vanilla, oily, butterscotch. Body, is well balanced and not to much alcohol. Finish is dry, subtle, then expands into something to remember. Not sure on the price and the container is typical OP. A NAS offering for TR only, but at 52% it's a little like a souped-up 12yo. I like this and the bottle, that I opened on 26 Sep when TH came to visit, is nearly empty. Personally I find a little water improves it. Vanilla and coconut immediately, and also very fruity. Exotic fruits behind the coconut - maybe some lime? 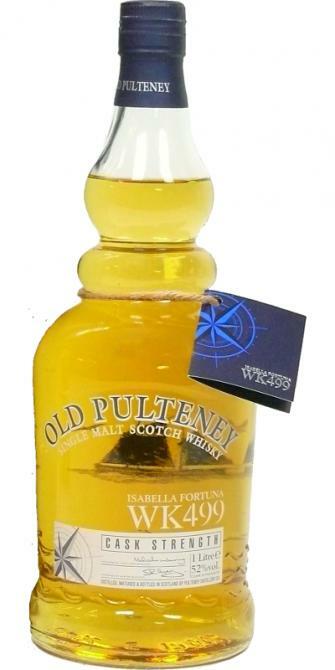 Not as salty as I expect from Pulteney, but none the worse for that. Quite fragrant. Again the vanilla and coconut. Carries the nose through into the palate. Slightly oily I feel. Some toffee notes (English toffees). A little more of the brininess I expect on the palate than there was on the nose. After a while, the fruit comes through the coconut. Slightly dry, in nice contrast to the sweetness of the coconut on the palate. Quite a lasting finish that now begins to show some spice from the oak.